Well, here we are in Kolkata, but at the moment there is no Book Fair for us to take part in. The High Court has forbidden the Booksellers and Publishers Guild to hold the fair on the Maidan, the big parade ground in the middle of town, for the peculiar reason that when the fair is held, apparently the Respirable Particulate Matter in the air around the Maidan rises to unacceptable levels. The fact that Calcutta's air seems to be about, ooh, 70% Respirable Particulate Matter all the time seems to have escaped people's notice. This is front page news in all the Calcutta papers, and there is great glee on the part of environmentalists for what has to be an infinitesimal victory over RPM. The Times of India editorialises that Calcutta's culture will be richer for this victory. 'Scuse me while I retrieve my eyebrows from the ceiling. Us Aussies are going ahead with a program anyway, but most of it will happen next week when I'll be Clarioning in Brisbane. I'll be visiting St John's Diocesan school and doing a reading and a panel before I go. This morning was a free day, and our wonderful Asialink coordinator Barry Scott organised a tour of amazing places. Let's see if I can remember them all: the Kali Temple to buy some luck (it turned out quite expensive, so expect great things this year); the unbelievably huge Victoria Memorial; Mother Teresa's tomb; the Marble Palace stuffed to the gills with dusty treasures. As well, we had coffee at the coffee co-op's cafe, and a really nice Bengali lunch at the Peerless Inn. As well, every street we were driven through was full of too many marvels to describe or even list; colours and faces and horrors and wonders just pour into your eyes (and ears, and nose) here. This afternoon we spent recovering, me by being unconscious - tonight we've cried off the dinner outing, being still full of lunch and unable to cope with more stimulation! A quiet night in at the Taj Bengal - now, should we go down and listen to the quartet playing in the lobby, or stay in the room and empty the minibar in front of Indian television? White Time is a BBYA Recommended Read for 2006. And 'A Fine Magic', my nasty story in Eidolon I, won an Aurealis Award last night for Best Fantasy Short Story. Sitting in the gate lounge on Republic/Australia Day. We’re on the way back to Chennai, hoping there will be fireworks, parades, brass bands and such waiting for us on India’s and our national holiday. Wednesday we managed to squeeze ourselves into the last Kerala backwaters cruise before the transport strike. This involved an hour’s dramatic driving, a banana-leaf’s worth of lunch, several hours’ very peaceful floating along waterways lined with palm trees, dropping in on a lime factory and a coir factory, then an hour’s return journey at breakneck speed through the thickening evening traffic Then (hi, Carson!) dinner in the rooftop restaurant of the hotel. Yesterday the transport strike meant that Kochi was a very good place to wander around. We saw elephants, an art exhibition, and the North Indian Craft Fair at the TDM Hall, which was hardly TDS at all, her-her. But it was a lot smaller than the excited advertorial in the Indian Express led us to believe it would be. Indian journalism is all about making the world more brightly coloured, just like Indian textiles, Indian advertising and Indian plastics. Oh, we are having a good time. There’s far too much to take in. Much of it is either unbelievably filthy or unbelievably brightly coloured. The smell of raw sewage on one hand and the scents of the spice markets on the other. Handsome faces vs fungus-mottled limb stumps. Crikey Moses. Yesterday we took the ferry from Ernakulam to Fort Kochi. We walked around for as long as we could, then hired an auto-rickshaw to show us around some more—after an hour and a half of that we had to stop and recover, and eat, so we sat in the Hotel Seagull and drank Kingfisher beer and ate Kerala rice and curries and watched dolphins and dredges and fishing boats and cable-layers and tour boats float by outside. Today will be a quieter day. We’ve some Internetting to do, and some Pilates (you have to bend quite well in the middle to get in and out of these auto-rickshaws) and some work (tweaking the Shimmaron novel). And before it gets too hot (or after, this evening) we will go out for another wander around Ernakulam. We are in Kochi after a journey across South India on the night train. I watched dawn over the rice fields, brick kilns and palm trees of Kerala. We shared our sleeper with a steel sheeting sales manager from Kochi and an IT worker from Chennai, both good conversationalists, who left the train earlier than us. We ate our first ‘meal’ meal at the railway café—dhosa with three dips and two north-Indian college girls, who didn’t think much of the South-Indian food—too spicy for breakfast, they thought. Then we caught a taxi to the hotel, but plumbing issues meant that we were offloaded to a different one, where we have a view out over palm fronds and rooftops. The beds are made of stone and the laptop is harnessed to the wall by about a hundred yards of filthy, split flex, but there is a desk, at least, where I hope to be able to get my bit of work done that I need to do over the next few days. Yesterday we went to Mamallapuram with a car and driver hired from the hotel (an adventure in itself, that drive). By the time we’d gone two-thirds of the way there we were already overstimulated out of our minds; then, there was Mamallapuram itself. It’s hard to say which was the most fascinating, the carvings or our fellow tourists/pilgrims. Now we’ve had a snooze and it’s off to explore Kochi. Oh. My. God. My tiny mind is broken. I’ve never been in a smellier, busier place. I’ve never had to cope with a bigger contrast between squalor and friendliness, dirt and beauty, my own wealth and other people’s poverty. We were out walking for about five hours today, and even after several hours resting in the hotel we don’t feel up to coping with going out into the streets again. The traffic is beeping past on Mahatma Gandhi Road, the sun’s gone down and the billboard floodlights have come up. To be honest, I didn’t see anything I wasn’t prepared for. I was glad I was prepared, though, for people using the street as a toilet or a handkerchief, and for beggars and noise and smells. I was also prepared for the colours, and the handsome people and gorgeous children, fabulous saris and flower-garlands, and deities painted or carved at every turn. More people greeted us just for the sake of being friendly than to beg for money or tout for business. 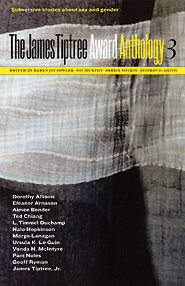 'The Point of Roses', the extra story in the UK edition of Black Juice has been shortlisted for a British Science Fiction Association award for Best Short Fiction of 2006. (via Gavin Grant) Because 'Wooden Bride' from Black Juice was shortlisted for the James Tiptree Award last year, it gets to share space between covers with Dorothy Allison, Eleanor Arnason, Aimee Bender, Ted Chiang, L. Timmel Duchamp, Nalo Hopkinson, Ursula K. Le Guin, Vonda N. McIntyre, Pam Noles, Geoff Ryman and James Tiptree, Jr. herself. Don't know about you, but I sure am dazzled. You can get a copy from Tachyon Publications. Karen Joy Fowler, Pat Murphy, Debbie Notkin and Jeffrey D. Smith did the editing, and John Berry the design. 'You will be subverted—and you will like it,' they promise (or is it a threat? ).